Star Warz remains the leading Drum ’n’ Bass event in Belgium. Even after 17 editions the Vooruit is each time again completely filled with Drum ’n’ Bass headz, loving it all the way ! 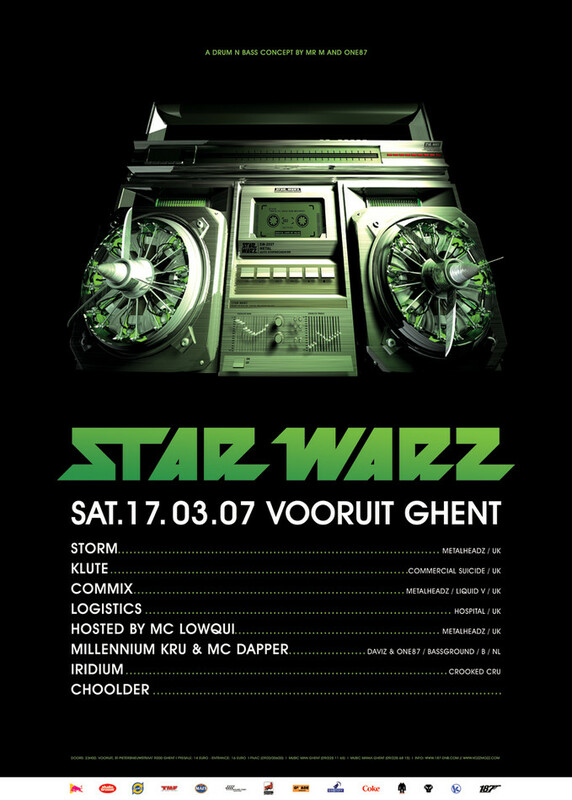 Star Warz always unites the biggest international names ( Goldie, Grooverider, Andy C, Ed Rush, Marcus Intalex, Doc Scott, and many more) with the most talented newcomers ( Chris Su, Artificial Intelligence, Simon Bassline Smith, Concord Dawn, ... ) and big names or young talents from Belgium. As such Star Warz represents all styles and evolutions within the scene and gives their public a broad look into the Drum ‘n’ Bass spectrum. Star Warz, wants to keep innovating; not only as a concept but also as a musical genre. Of course, the crowd makes the Star Warz parties such a success: an open-minded, up-for-it public that admires Drum ’n’ Bass, wants to be surprised and that creates that special atmosphere that makes everybody raving! This time they will be raving to the sounds of DJ Storm who’s career has changed dramatically in the last few years. Tragically her best friend and DJ-ing partner, Kemistry, was suddenly killed in a car accident. The pair were a unique and pioneering element in our scene, as the only female duo in the circuit, each with a strong identity which perfectly complemented each other’s style. Having the music beside her, Storm has found a way to carry on as an artist. As what she and Kemi shared, more than anything else, was this undeniable passion for Drum ’n’ Bass. So with her dubplates in hand, she continues the journey, with an angel in mind and the bass to keep her moving …. Also on the line-up is Klute. He has been a fixture on the Drum ’n’ Bass scene for over a decade, lending his creativity to the likes of Metalheadz, 31 Records and his early stable Certificate 18, responsible for releasing his first two albums, Casual Bodies and Fear of People. In 2001 his own Commercial Suicide imprint was born and so far the label has seen releases by Klute himself, Calibre, Amit, AI, Tactile, Total Science, Digital, and Austrian prodigy D.Kay. But Star Warz wouldn’t be Star Warz if we hadn’t dug up some fast rising talent to look out for. First up is Commix, they have only been around for about 4 years but have releases scheduled on leading labels as Hospital, Liquid V, Metalheadz, Innerground and Teebee’s Subtitles label. Just as promising is Logistics, called “Soulful Drum ‘n’ Bass’ brightest young thing” by IDJ magazine and they have just released their debut album “Now more than ever” with shining glory ! A star MC is also a steady value on Star Warz. This time that’s MC LowQui who has been touring extensively with Goldie and the Metalheadz crew. He was also seen alongside Artificial Intelligence for their label launch tour as well as many other heavy hitters in the scene including Andy C, Shy FX, Fabio and the Movement Crew. A versatile MC, he can flow effortlessly at events for the breaky heads to the big raves, while at the same time offering lyrics that really say something meaningful. Watch out – and listen up -- for this man on Star Warz ! The international guests will get the full support of the residents Millenium Kru, who have struck up a new alliance with MC Dapper, and young Belgian talent, Choolder.